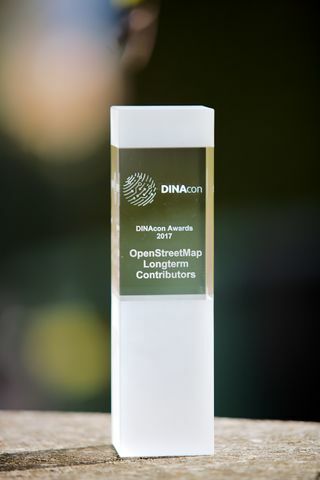 The OpenStreetMap community recently received an award at the DINACon conference on digital sustainability. OpenStreetMap is showing itself to be sustainable in various ways. Our database is available to download in its entirety, which helps to ensure the hard work of our contributors will always live on regardless, but our core servers keep humming thanks to many generous donations to OSMF over the years, as well as funding from our corporate membership programme. Most important of all, our community continues to thrive, attracting new members, while retaining wonderfully dedicated long-term contributors (to whom this award was dedicated). Thank you to everyone who helps make OpenStreetMap sustainable. Thanks also to Simon Poole, Stefan Keller, and Michael Spreng who accepted the award, as well as running an OpenStreetMap session at this conference. The Influential Writing Award went to Ramani Huria – Great blog posts about community, mapping, techniques for OpenStreetMap in Tanzania and Africa. The Expanding the Community Award went to Pete Masters – For 4 years as Missing Maps project coordinator, introducing countless contributors to OSM, supporting communities in Bangladesh, DRC, CAR and many other countries. Remarkable outreach for humanitarian mapping & OSM in general. The Ulf Möller Memorial Award went to Martin Raifer – For the Overpass Turbo web based data mining tool. The OSM awards website has a list of all nominees, and details of why they were nominated (also on this blog). Well worth a read. 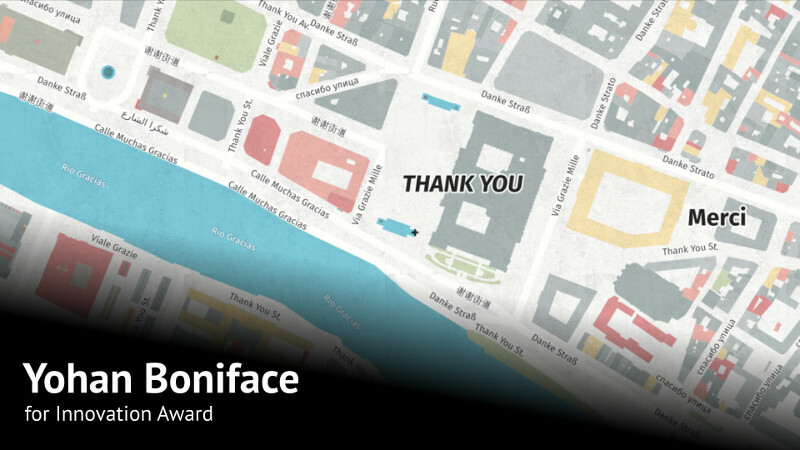 It’s a catalogue of spectacular individual contributions made to OpenStreetMap throughout the 2016/2017, and all of these nominees deserve our congratulations. This entry was posted in State of the Map and tagged Awards, awards2017 on November 5, 2017 by HarryWood. 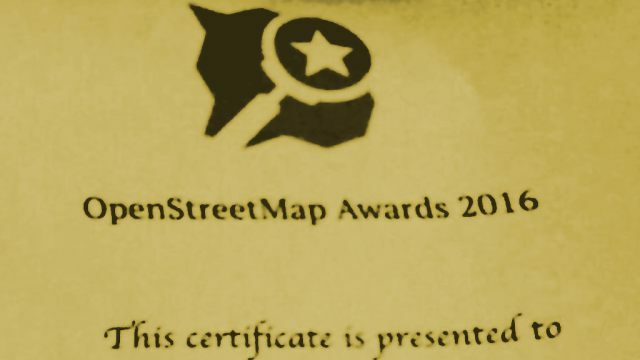 The community voting for the OpenStreetMap Awards 2017 continues! We have 45 nominees, any number of which you can support, and only nine of them will receive the award. This is a hard choice, and to help you, we are continuing the series of posts about the work nominees did. For the best tutorial, documentation, blog or a blog post. A text or series of texts that attracted many new people to OSM, provided an interesting outlook on the project, or inspired the community to do better things. Carto’Cité: there are few blogs about GIS in non-English languages, and we are lucky to have this one. Carto’Cité is a geomatics agency in Nantes, France, and not only they do work for their clients, they also regularly publish very detailed tutorials for using OpenStreetMap data in QGIS, uMap and other open tools. Joost Schouppe : being the most visible member of the Belgian community, he organizes local events and publishes a very diverse and useful diary. He writes in detail about analysing OSM data, using data from government, about impact of mapping parties and Missing Maps events, and interviews interesting people. BushmanK: he has posted many thoughtful diary posts about various aspects of OpenStreetMap, which make you question everything: mapping time zones, adding name translations, tagging man-made structures, using signs for names, and even governance of the map. Ramani Huria: they are the very active community in Tanzania, and their blog is full not only with event reports, but with tutorials on JOSM, QGIS and mapping techniques, in both English and Swahili. Their articles are useful both to people from their country and to everyone else. Arun Ganesh: better known as PlaneMad, he is the leader of the Mapbox’s data team, always watching for errors on the map and analysing data, examining mapping applications or styling maps in his spare time. All of that you can see in his blog, complete with diagrams, screenshots and funny pictures. For significant contributions to the map data, or exemplary mapping: micro-mapping, clean-up, mapping towns from scratch, proper imports. xscvxc: while most of us map cities we live in, xscvxc is busy mapping small towns in his region, not on the radar of urban mappers. In his 2.8 million edits he perfected his home town and proceeded to improve many other rural areas of Novosibirsk Region in Russia. Russell Deffner: to predict and prevent malaria disease spread, you need all the settlements and their buildings on the map. Russel has coordinated a global effort to map more than 4 million buildings across 7 countries, which is a lot. Read about this on the HOT project page. Jochen Topf : in March there were a quarter million old-style multipolygons, and now there is none. All thanks to Jochen, who is coordinating the continuing series of polygon fixing tasks, complete with statistics, maps and explanations. Subscribe to this github issue to learn about new tasks, and help him make the OSM data simpler to use. 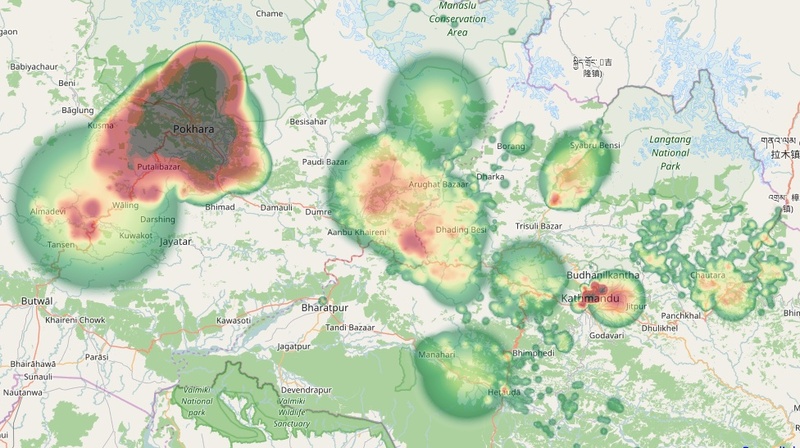 Bishal Bhandari : for a year and a half he has been actively mapping cities in Nepal: Kathmandu, Pokhara, Tikapur and others. There are few days he goes without adding something to the map: even today he’s drawn a lot of school buildings there. katpatuka: if you’ve been in OpenStreetMap for at least a year, you’ve sure seen edits by katpatuka. In his 10 years of editing he made 30 million changes, mostly to Turkey and China. There is no point in showing his editing heat map: he has touched almost every point on Earth, focusing on less-developed areas. And he had not slowed down: it’s like if everyone else leaves OSM, thanks to katpatuka the map will still be complete eventually. We hope you have made your choices — head to the OSM Awards website and mark people and groups that you think did the best job the previous year. You can choose any number of nominees, and the choice can be changed at any moment before the voting closes on the 16th of August. We’ll return next week to look at the regional categories. This entry was posted in Uncategorized and tagged awards2017 on July 26, 2017 by Ilya Zverev. The community voting for the OpenStreetMap Awards 2017 is open! During the call for nominees you submitted more than a hundred of them. Then a number of active community members have prepared a shorter list. Now it is again your turn: choose who gets an award at the ceremony at the State of the Map in Japan. This time you would need to consider 45 nominees in 9 categories. That is a tiny fraction of active community members who did good in the past year, but still a lot to choose from. To make your task simpler, we have made a couple of changes. You don’t have to select only one nominee for a category: that was a hard choice last year, and most of the time you’d wish you had more votes. Now you have! Choose as many as you like, even all of them. This process is called Approval Voting: studies show it is much fairer that the regular one-vote voting, and much easier to understand than STV. The winner is still determined by the number of votes. And do use the fact that you can change or add to your votes at any time until the voting ends (that would be on 16th of August). We will cover all nominees in this blog, so you could make an informed choice. Starting right now, with the two technical categories. Nominees are listed in a random order. For outstanding contributions to any of the core tools, systems, processes or resources. Not limited to systems under OSMF control. The Rails port, mapnik, and any other tool that mappers use on a daily basis, knowingly or not, are eligible. Hartmut Holzgraefe: the old MapOSMatic service for printing atlases went offline, but Hartmut set up the fork last year. And he did not stop at that: every week he is improving it in different ways. He has the biggest collection of map styles ready for printing. He added email notifications and fixed UI issues. You can even add your data on top of the map. Bryan Housel: you know iD, our amazing web-based editor. Bryan is supervising its development. Recently he has added a tutorial to it, and it is years ahead of what other OSM software offer. That tutorial even has an entire imaginary town to play with! Andy Allan: he has been improving OSM in small ways long before, but just a month ago Andy joined the website maintainers team and immediately started working on improving the code. And before that he upgraded all the tests for the website: important, but not very fun work, we guess. Kevin Bullock: as an employee of DigitalGlobe, he has been always asked at State of the Map conferences about new satellite imagery for OpenStreetMap. This Spring, due to his efforts, we finally got two new imagery layers. You must have already seen them in your editor of choice. Paul Norman and Matthijs Melissen: for more than half a year these two had been working on a major refactoring of our map style, the one you’ve liked even after roads changed their colours. Now all the rendering databases were reloaded, and style designers can finally use any tags they like: surface, covered, public_transport, you name it. For the best new service or approach. New tools for contributing data, image recognition, trace or OSM data analysis, new mapping approach or new perspective on old tools. Michael Straßburger: do “telnet mapscii.me” in a console, and you will see a map of the whole world, rendered with letters and punctuation. MapSCII is a brilliant example of all our map rendering technologies at work: vector tiles from the last year winner OSM2VectorTiles, mapbox GL styles, vector transformations. While visually simple, it proves we can do anything with our map. Yuri Astrakhan: people have long used SPARQL queries with Wikidata, and Yuri’s service links that with the spatial OSM database using 750 thousand “wikidata” keys we have. Now you can query for cities more than 2000 years old or get first ascension time for mountain peaks and get OSM identifiers for these. OpenTopoMap maintainers: made by Stefan, Philipp and Martin, OpenTopoMap renders the whole world in a topographic style falimiar to tourists and hikers. It also provides weekly updated Garmin extracts, so you don’t have to buy paper maps for a trip. Tobias Zwick: he is the author of the StreetComplete android map editor. Announced just in March, it has taken mappers by the storm, with half a million edits made by 5000 users. The app makes it very easy to map important properties of roads and amenities. Tobias constantly improves the app and listens to the comments on mailing lists and on GitHub. Sajjad Anwar: visualizing changesets is one of the hardest problems in OpenStreetMap. Most of us has been using Achavi, but it is slow due to the nature of requests to Overpass API. Sajjad removed the need for querying by creating a cache of all recent changesets, so visualizing takes less than a second. His work is already used by the OSMCha, a validation tool, and could possibly be integrated into the OSM website. Now that you know what these ten nominees did, head to the OSM Awards website and click on these you think should get an award for their work. We’ll return next week to look at writing and mapping categories. This entry was posted in State of the Map and tagged Awards, awards2017 on July 20, 2017 by Ilya Zverev.